Price, floorspace, capacity and quality are the main things to look for in a machine like this. While the Kity BestCombi is probably one of the smallest around, any universal will occupy a lot more room than a single-function machine of the same capacity. 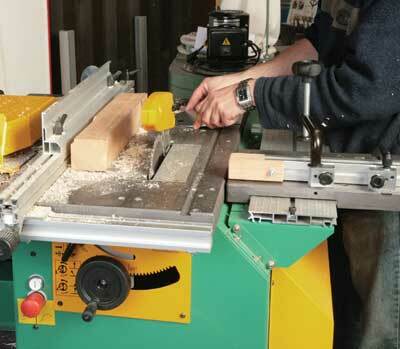 The space benefit comes when you consider how difficult it can be to fit a tablesaw, a planer/thicknesser, a spindle moulder and a morticer into a small workshop. The BestCombi, made for some years by French company Kity for its German owner, Sheppach, is equipped to do the job of all these at a price less than many makers would charge for just one. It comes with three single-phase 230V induction motors, a motor selector switch at the far end and stop and start buttons at each end. The saw arbor is driven by its own 1100W motor while the spindle moulder and the planer/thicknesser sections each have a separate 1500W motor. The cast-alloy table is rectangular and divided into three parts; adjustable planer infeed and outfeed sections, overall 900 by 200mm, and the larger fixed sawing and moulding section at 900 by 560mm. While you cannot expect this alloy to be quite as rigid and dead to vibration as cast iron, it is a good size and keeps the overall weight down. The dark grey surface has been heat-treated to harden it. The tables are supported on a heavy-duty fabricated steel cabinet. Defying convention, crosscut sawing is carried out on the right-hand side of the machine and rip-sawing on the left side of the blade, an arrangement that is easy to get used to so long as you remember to stand to the right of the blade to avoid kickbacks. The same fence efficiently doubles up for rip-sawing and for surface planing. The 200mm-diameter of the tungsten carbide-tipped blade limits the depth of cut to 60mm or 40mm with the blade at 45 degrees – still adequate for most furniture work. Rise and fall is adjusted by a chunky little black hand wheel on the near end of the machine. Dust collection, via the100mm hose beneath the large yellow hopper and a vacuum hose connection on the crown guard, works effectively with a small extractor. 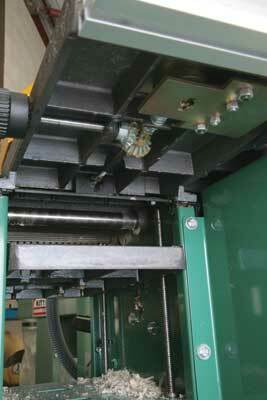 The cast-alloy sliding crosscut carriage runs on anodised extruded aluminium sections. It has a stroke of 1000mm with a pleasingly useful capacity of 800mm cut in front of the blade. 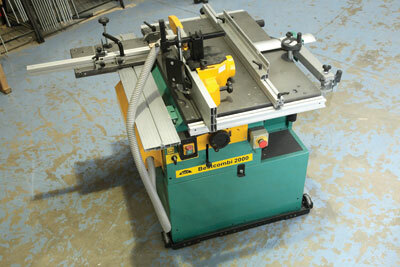 For surface planing there is a pair of 200mm-wide tables at the rear of the machine with an overall length of 900mm. The narrow capacity means panels may need more edge joints than normal. The jointing fence, which also acts as the saw's rip fence, is rigidly clamped and an additional extrusion mounted on top gives it a good height. 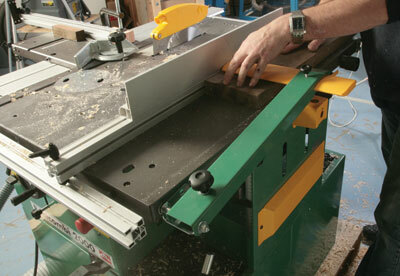 The planer comes with a pair of standard resharpenable high-speed-steel knives which leave a good finish. For thicknessing, the planer infeed and outfeed tables stay in place while the depth of the thicknessing table beneath is adjusted with a hand wheel that plugs into the outfeed table. 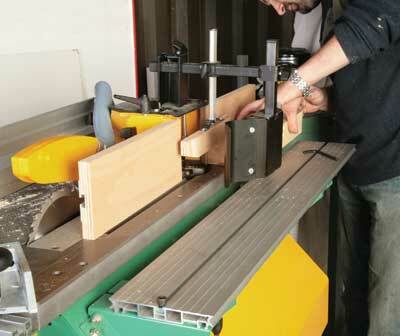 The thicknessing capacity of 195mm wide by 200mm deep is adequate for small furniture work. The BestCombi thicknessed hardwood smoothly and quietly and handled knotty softwood up to the maximum cutting depth of 3mm without complaint. The spindle moulder rise-and-fall wheel on the right-hand end panel is similar to the circular saw, with an adjustment of 85mm. The spindle cutter block is fitted to a standard 30mm spindle which rises through a covered hole just behind the sawblade. 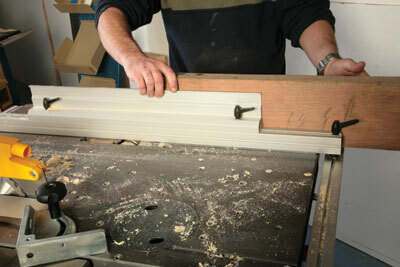 In practice, changing from sawing to spindle moulding is a simple procedure and quicker than some larger universals. 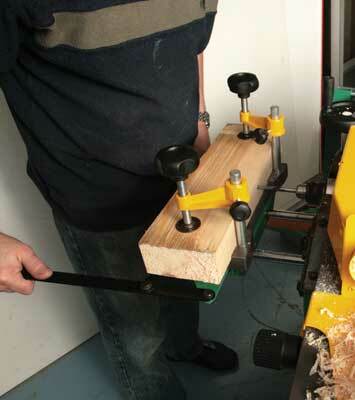 The yellow guard casting around the cutterblock provides adjustable support for the plywood fences. I like the use of plywood here because it has more mass than the alloy extrusions commonly used for fences and is good for attaching a false fence. The steel front guard comes with Shaw guards to secure the work against the fences and tooling. The moulder runs quietly and smoothly while the dust extraction works moderately well, with the usual shower of chippings escaping the guards. 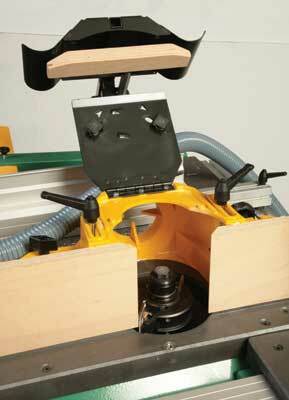 The slot morticing cutter fits on the end of the thicknesser/planer cutter block. A steel table attachment on the back of the Combi carries the timber. 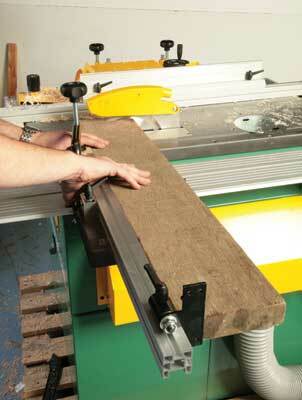 Hand levers slide the table towards the machine for depth of cut and horizontally to elongate a mortice. The morticer is a lightweight optional extra that you might be able to negotiate with a supplier as part of a deal. This is quite a big machine for one with a small capacity, but nonetheless it is large enough for most furniture work. Changing between functions is very easy. The BestCombi is well constructed and sturdy enough for a new maker producing a small amount of furniture, although it is not designed to stand up to continuous professional use. The full list price of just over £2,000 is amazing value, but with the recession-busting deals available at the moment the BestCombi has to be a serious competitor in the starter market. "The BestCombi has to be a serious competitor in the starter market"